Over four years ago as an expectant mother becoming acquainted with the concepts related to attachment parenting, I knew I wanted to wear my baby even though I was only vaguely familiar with the benefits. I set out to find the perfect carrier to meet this desire, doing research through various online forums. At the time I thought it was just as simple as finding a carrier that was cute and comfortable. I knew that babywearing would help serve as a parenting tool, allowing me to be hands free to complete tasks while holding my baby, and I also knew that babywearing would facilitate bonding. Little did I know, I had only just begun to scratch the surface with my simplistic understanding of the power of babywearing. Within a three year time frame I gave birth to three children, each about a year and a half apart. My quickly expanding family and diverse, intense needs of each of my young children allowed me to delve very deeply into the world of babywearing. The practice of wearing my children not only enabled me to maximize my snuggle time but also allowed me to be a more effective caretaker while accomplishing day to day tasks. It was my saving grace and my sanity! The more time I spent babywearing, the more familiar I became with the depth of the effects this practice had on our lives as a family and in the development of my children. As babywearing continued to serve a highly pertinent role in my survival and parenting approaches, I began to study this practice in a more specific way, moving from being an avid babywearer to a babywearing educator. This journey has enlightened me in ways I never would have imagined, and it sparked a passion within me to share my experiences and babywearing knowledge with others. As an attachment parent, I have always known that holding your child close for prolonged periods of time could facilitate bonding. As a new babywearer over four years ago, I was under the distinct impression that simply plugging my baby into the carrier and following the manufacturer’s instructions would then set the stage for an ultimate babywearing experience. What I didn’t know, however, was the vast importance of applying effective babywearing techniques in order to maximize the effects. By accessing deeper knowledge about babywearing positioning and practices, I have learned that the word bonding doesn’t even come close to explaining the depth of the emotional and physical benefits. 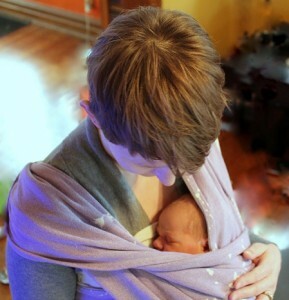 One myth of babywearing is that it is a “plug and play” practice. People assume that babywearing is inherently safe, and that any available carrier on the market will be able to deliver the same caliber of babywearing experience for both caregiver and child. This, however, could not be further from the truth. The reality is that babywearing is a safe practice, but the safety and benefits do rely heavily upon applying proper positioning and by making an optimal carrier choice. When I first started out as a babywearer, the positioning standards were quite different than what they are today. As we research, learn, and grow within the practice, we have learned that certain positions are preferred over others, some for safety issues, and some to help respect the physiological needs of our babies. When I wore my oldest daughter it was considered perfectly safe to wear a baby cradle style in a carrier. We were at the foot of a major carrier recall with the Slingrider, bag slings made by Infantino, and it became largely publicized that it was important to never allow the baby’s chin to touch the chest. I spent months as a new parent nervously checking the sling to be sure my baby’s chin was not touching her chest, repositioning her constantly to help maintain a safe position. What we now know is that it is not safe to carry a baby in the cradle position because it is simply too challenging to ensure that the baby’s airway is unobstructed. What babywearers have learned from past experiences is that the safest position to carry a baby is in the upright position, heart to heart, held tightly and securely. Coming to terms with applying this upright positioning has allowed for so much more than ensuring an open airway, it actually revealed a whole new realm of babywearing benefits. Many studies have shown the physiological impact of having the baby close to the caregiver using this optimal upright positioning, including the regulating of body temperature, stabilization of the heart rate, and the lowering of anxiety in newborns and infants. When wearing our babies in an upright position, we are allowing our bodies to further connect, going above and beyond fulfilling a baby’s basic needs, which allows them the opportunity to dedicate more energy toward growing and developing. With the help of the medical community we have come to know more about the impact of positioning within the practice of babywearing. In addition to knowing the importance of upright positioning, medical professionals such as orthopedists and chiropractors have been essential in helping the babywearing community gain more understanding about the necessity of honoring the hip and spine growth of our babies as well. We now recognize the importance of achieving a natural spread squat position in a carrier, which mimics the baby’s physiological instinct to pull the legs up into a squat position in a way that honors the spine curvature. As we learn more about optimal ways of achieving a natural spread squat position in a carrier, it has also been recognized that wearing legs out from birth, rather than “froggied” inside of the carrier, better achieves optimal hip and spine placement. Babywearing can reinforce this optimal positioning with carriers that support the baby from knee to knee, allowing the bottom to be lower than the knees, supporting the natural curvature of the spine. Wearing a baby’s legs out from birth in a natural spread squat position not only helps achieve optimal positioning for hips and spine development, but it actually sets the stage for further physical development. In this optimal position, a baby is able to utilize their legs to brace against the parent, which promotes the development of core strength and muscle tone. In a carrier, a young infant is also motivated to quickly develop head, neck, and upper spine strength as they strive to engage in the world around them, while also having a caretaker to snuggle into when the world becomes too much. Babywearing has the potential to not only help these little bodies form as best as possible, but also to develop overall strength as they grow, all while in comfortable closeness with the caretaker. Additionally, as a baby participates along side the caretaker, immersed in the world around them, with their physical and emotionally needs fully met, more neurological pathways can form, linguistic skills honed, actions and responses modeled, better preparing the child for their future as a more active participant in the world around them. As I have witnessed the evolution of babywearing protocol and standards over the years, I feel very strongly about committing myself to the practice of ongoing education to ensure that I am constantly aware of the best practices of babywearing. Our carriers are essentially an extrogestational womb, allowing us to unlock an unimaginable amount of physical and emotional benefits. We are caretakers embarking on the journey of wearing our babies as a lifestyle, as an essential component of our attachment parenting endeavors, and the practice of babywearing has the capacity to affect our children in ways that will transcend their whole lives as physical and emotional beings. Babywearing has the capacity to far exceed our expectations of promoting bonding and facilitating hands free parenting, and applying best practices of positioning is the key to accessing the full range of benefits. Steffany Kerr is a mother to three children, Lilah, Miles, and Violet, and wife to Jade. 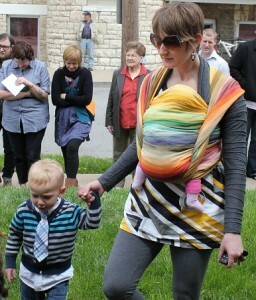 She is founder and President of Babywearing International of Kansas City, a chapter of Babywearing International. Steffany is also a Certified Babywearing Instructor through Babywearing Institute, holding both basic and advanced certificates, and is also a certified educator with specialization in literacy and language acquisition. She is a dedicated babywearing educator and advocate in the Kansas City area, and also an active participant in the homeschool and parenting community at large. 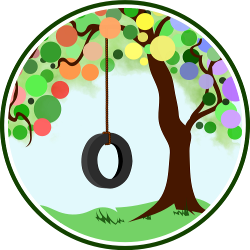 “Keep Them Close and Let Them Go: Fostering Healthy Attachment As They Grow” — Helen at Zen Mummy wonders how to maintain a healthy attachment as our children become more independent. “Honesty (With Your Children) is the Best Policy” — Mandy at Living Peacefully With Children shares how honesty with her children is helping to build an authentic relationship which will last through the teen years and beyond. “Fostering Healthy Attachment?” — Momma Jorje discusses how she is building a foundation of attachment with her children and how she hopes it serves them in their lives as they grow into adults. Beyond Bookend Parenting — Marisa at Deliberate Parenting describes their efforts to maintain their toddler’s attachment to her working parent through play and routines throughout the day. Have You “Huggled” Today? — Kerry at City Kids Homeschooling shares how “huggles” work like magic in her home. Your Childhood=Your Child’s Childhood? — Amy at A Secure Base examines the research about how our attachment experience can shape our attachment with our children. Beyond Bonding: The Power of Positioning in Babywearing — Steffany, a babywearing educator, guest posting at Natural Parents Network, explains how optimal positioning in quality carriers can help babies’ physical growth, brain development, and overall attachment. The Evolution of Attachment: Parenting Without a Roadmap — Sheila at A Living Family reflects on her family’s recent generation of mothers and shares how she is working to make an evolutionary leap towards forming healthy attachment. The Farm in my Bed — Jennifer at Hybrid Rasta Mama discusses fostering children’s healthy attachment to “lovies” and comfort objects.. Thank you for this information! I love babywearing, and, of course, I’ve thought of the emotional and cognitive benefits to my child, but this gives me so much more information on the physical benefits and considerations. I will certainly keep it in mind for my next carrier purchase! i would love to get your opinion on why i have two children now, who vehemently hate being worn. I have tried many different carriers, holds, and followed all the little tips an tricks. Nothing works. my son I gave up on, but my daughter is a very high maintenance 4 months old. I NEED to be able to wear her, but yet every time i try (almost every day) she screams even harder.I have watched a billion youtube videos-so i know I’m putting her in correctly! Any advice would be great! I feel like an Attachment Parent who’s kids want none of it! Laura, in my decades of experience in teaching babywearing, the only time I have encountered children not wanting to be worn is when there was something bothering them in the dynamic of the family. It actually was not a matter of babywearing but a matter of family dynamics. As soon as that was resolved baby wanted to be worn. A family constellation after Hellinger would be a great way to explore that. sorry, i don’t understand what you mean! could you explain? You might want to google family constellation Bert Hellinger and you’ll find more information on different websites. There is a dynamic in the family that feels safe for the child and they can move freely and develop. If there is anything off in the dynamic, a child will act on it. If there is stress between the parents or a grandparent causes stress or anything within the family, a baby will act on it. They might push away from the main caretaker without an obvious reason but once you explore you will see why they were pushing away and they did have a reason. It is something that I advice every time when there is a problem in the dynamic and it is a real eye opener. Hope you can find someone trained in the family constellation close to you. Ailia has never liked being froggied, so we’ve instinctively done the spread/squat hold in these first few months. I’m glad to find out that baby knew best! This is great information! What position is most optimal for nursing? I’m planning to take my new baby to church and a few work-related meetings and thought I would keep the baby in the carrier and nurse at the same time. Is this safe or even possible? I’m interested in this too. I was able to nurse with a wrap and a ring sling with my 1 1/2 year old, but haven’t tried yet with my 2 month old. Keren and Sarah, there are several ways to nurse a baby in a baby carrier. Wraps and ring slings are probably easiest to work with. I find nursing shirts that have openings directly at the breast to be the best and easiest to work with. A certified babywearing educator in your area will be able to help you find the best and easiest way to nurse in the carrier of your choice. I’m curious what your advice would have been for me—my babies absolutely refused to be worn upright. I did the cradle position, with a towel under her neck, and that was what she needed. Would you have recommended me not wear her at all? Because those were my options, as far as I can tell. Sounds like you were able to find something that your baby liked, however, because of the recent death in baby slings using the cradle carry, and the hip position not being favorable, I wonder if you tried different carriers, different materials, different styles. Sometimes babies respond to the fabric, not the carrying way. Sensory integration disorder is often already present at birth. Working on holding baby more upright with vestibular stimulation would be helpful. Of course honoring the fetal tuck of baby when carrying baby upright is also important. If baby feel able to be in a natural position they do relax into the carrier which should be sturdy enough to hold them and give them definite boundaries. To find out how to get baby comfortable upright would take more time than I have typing but trying different materials and making sure the fetal tuck, legs out, is honored should make a difference. Great post Steffany! I too am a BW educator (in Canada) and do not teach or recommend a cradle position anymore. Have you seen the article from The Hip Dysplasia Institute complete with babywearing pictures? It is fantastic! This is great information! We were at the Children’s Museum in Boston today and I got quite a few “that’s great that you’re wearing your baby!” remarks from other moms and from older women as well. I’m definitely not an expert, but whole-heartedly a believer in baby wearing! What great information about physical development! Actually, cradle carry is a safe carrying position – and you have to remember that babies have died in upright carriers, more recently the death in the Snugli, where the baby was too small for the carrier, unmonitored and fully covered. The most important thing about carrying your baby is to be an active parent, to wear them snug and high and to make sure, regardless of the position, that their chin is not touching their chest. I think the cradle carry is a natural, short term, transitional carry that is perfect for nursing on the go, transitioning down for a nap or for whatever the mom needs. I teach the cradle carry because it is the one that benefits the most from being taught directly to moms face to face, rather than on a DVD, UTube or whatnot. Steffany, this is such an insightful and informative article. I agree with you that babywearing with littles ones underfoot is so imperative in helping to keep one’s household running smoothly when a new addition arrives. What are your favorite wraps for newborns? Fantastic article, Steffany. Your writing is thorough and very articulate. Your expertise in babywearing comes across clearly. I am so glad to see you writing for NPN and I hope you keep contributing! I really appreciate this article. I’ve been wearing my babies upright since they were newborns, because it’s what we’ve all preferred. I’m glad to hear it’s optimal, and the reasons behind it. I also find it relatively easy to nurse in a carrier (mei tai) with the baby upright, because I can lower him down to breast height. this is such an interesting post. Thank you for submitting it to the carnival. Would you be interested in writing an article on breastfeeding in a carrier for Authentic Parenting? After 3-4 months (when Baby can grab his feet on his own) the space between the knees can be wider, Baby can straddle the wrapper. Hi there! Could you share the study that says newborn legs out from birth is best? I have a new little one and have been researching! Thank you!